Guts* Boosts Attack if there is a status problem. "When this Pokemon has a major status ailment, its Attack increases by 50%." The evolved pokemon is based on which element Stone you use on Eevee. excessively hot. 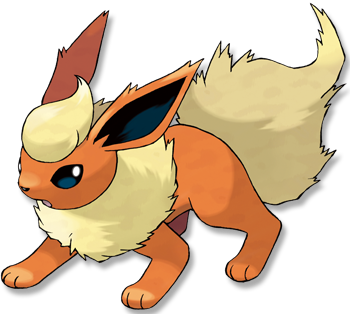 This POK�MON�s body temperature can rise to a maximum of 1,650 degrees F.
Emerald FLAREON�s fluffy fur releases heat into the air so that its body does not get excessively hot. Its body temperature can rise to a maximum of 1,650 degrees F.
Leaf Green When storing thermal energy in its body, its temperature can soar to over 1,600 degrees Fahrenheit. Diamond/Pearl It has a flame sac in its body. Its body temperature tops 1,650 degrees Fahrenheit before battle. Platinum Inhaled air is heated in the flame sac in its body to an intense fire over 3,000 degrees Fahrenheit. Heart Gold It stores some of the air it inhales in its internal flame pouch, which heats it to over 3,000 degrees Fahrenheit. Soul Silver It fluffs out its fur collar to cool down its body temperature, which can reach 1,650 degrees Fahrenheit. Black Inhaled air is heated in the flame sac in its body to an intense fire over 3,000 degrees Fahrenheit. White Inhaled air is heated in the flame sac in its body to an intense fire over 3,000 degrees Fahrenheit.